Learn how to use Git to track large multimedia files in your projects in the final article in our series on little-known uses of Git. Git is very specifically designed for source code version control, so it's rarely embraced by projects and industries that don't primarily work in plaintext. However, the advantages of an asynchronous workflow are appealing, especially in the ever-growing number of industries that combine serious computing with seriously artistic ventures, including web design, visual effects, video games, publishing, currency design (yes, that's a real industry), education… the list goes on and on. In this series leading up to Git's 14th anniversary, we've shared six little-known ways to use Git. In this final article, we'll look at software that brings the advantages of Git to managing multimedia files. You can see the problem here: Removing a large file after it's been committed increases a repository's size roughly eight times its original, barren state (from 108K to 828K). You can perform tests to get a better average, but this simple demonstration is consistent with my experience. The cost of committing files that aren't text-based is minimal at first, but the longer a project stays active, the more changes people make to static content, and the more those fractions start to add up. When a Git repository becomes very large, the major cost is usually speed. The time to perform pulls and pushes goes from being how long it takes to take a sip of coffee to how long it takes to wonder if your computer got kicked off the network. The reason static content causes Git to grow in size is that formats based on text allow Git to pull out just the parts that have changed. Raster images and music files make as much sense to Git as they would to you if you looked at the binary data contained in a .png or .wav file. So Git just takes all the data and makes a new copy of it, even if only one pixel changes from one photo to the next. In practice, many multimedia projects don't need or want to track the media's history. The media part of a project tends to have a different lifecycle than the text or code part of a project. Media assets generally progress in one direction: a picture starts as a pencil sketch, proceeds toward its destination as a digital painting, and, even if the text is rolled back to an earlier version, the art continues its forward progress. It's rare for media to be bound to a specific version of a project. The exceptions are usually graphics that reflect datasets—usually tables or graphs or charts—that can be done in text-based formats such as SVG. So, on many projects that involve both media and text (whether it's narrative prose or code), Git is an acceptable solution to file management, as long as there's a playground outside the version control cycle for artists to play in. A simple way to enable that is Git-portal, a Bash script armed with Git hooks that moves your asset files to a directory outside Git's purview and replaces them with symlinks. Git commits the symlinks (sometimes called aliases or shortcuts), which are trivially small, so all you commit are your text files and whatever symlinks represent your media assets. Because the replacement files are symlinks, your project continues to function as expected because your local machine follows the symlinks to their "real" counterparts. Git-portal maintains a project's directory structure when it swaps out a file with a symlink, so it's easy to reverse the process, should you decide that Git-portal isn't right for your project or you need to build a version of your project without symlinks (for distribution, for instance). Git-portal also allows remote synchronization of assets over rsync, so you can set up a remote storage location as a centralized source of authority. Git-portal is ideal for multimedia projects, including video game and tabletop game design, virtual reality projects with big 3D model renders and textures, books with graphics and .odt exports, collaborative blog websites, music projects, and much more. It's not uncommon for an artist to perform versioning in their application—in the form of layers (in the graphics world) and tracks (in the music world)—so Git adds nothing to multimedia project files themselves. 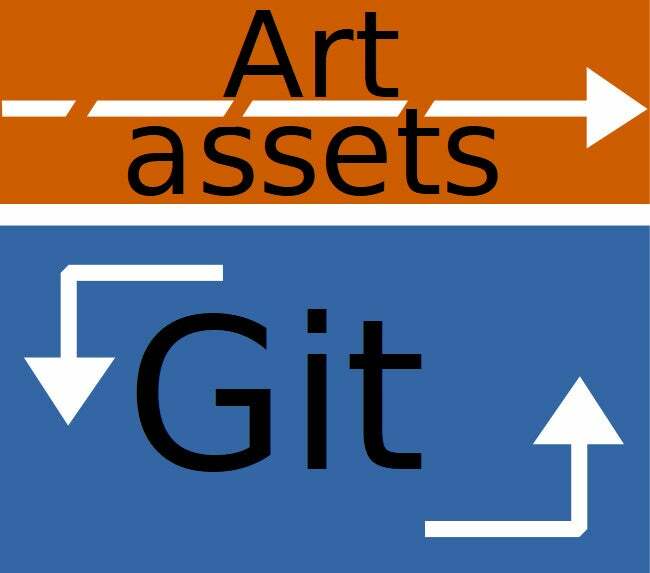 The power of Git is leveraged for other parts of artistic projects (prose and narrative, project management, subtitle files, credits, marketing copy, documentation, and so on), and the power of structured remote backups is leveraged by the artists. There are RPM packages for Git-portal located at https://klaatu.fedorapeople.org/git-portal, which you can download and install. Git-portal's init function creates a _portal directory in your Git repository and adds it to your .gitignore file. $ cp -r ~/synth-presets/yoshimi . Directories cannot go through the portal. Sending files instead. If you're using Git-portal for a personal project and maintaining your own backups, this is technically all you need to know about Git-portal. If you want to add in collaborators or you want Git-portal to manage backups the way (more or less) Git does, you can a remote. Adding a remote location for Git-portal is done through Git's existing remote function. Git-portal implements Git hooks, scripts hidden in your repository's .git directory, to look at your remotes for any that begin with _portal. If it finds one, it attempts to rsync to the remote location and synchronize files. Git-portal performs this action anytime you do a Git push or a Git merge (or pull, which is really just a fetch and an automatic merge). You may not want to give all of your users individual accounts on your server, and you don't have to. To provide access to the server hosting a repository's large file assets, you can run a Git frontend like Gitolite, or you can use rrsync (i.e., restricted rsync). If you have Git-portal installed and a _portal remote configured, your _portal directory will be synchronized, getting new content from the server and sending fresh content with every push. While you don't have to do a Git commit and push to sync with the server (a user could just use rsync directly), I find it useful to require commits for artistic changes. It integrates artists and their digital assets into the rest of the workflow, and it provides useful metadata about project progress and velocity. If Git-portal is too simple for you, there are other options for managing large files with Git. Git Large File Storage (LFS) is a fork of a defunct project called git-media and is maintained and supported by GitHub. It requires special commands (like git lfs track to protect large files from being tracked by Git) and requires the user to manage a .gitattributes file to update which files in the repository are tracked by LFS. It supports only HTTP and HTTPS remotes for large files, so your LFS server must be configured so users can authenticate over HTTP rather than SSH or rsync. A more flexible option than LFS is git-annex, which you can learn more about in my article about managing binary blobs in Git (ignore the parts about the deprecated git-media, as its former flexibility doesn't apply to its successor, Git LFS). Git-annex is a flexible and elegant solution with a detailed system for adding, removing, and moving large files within a repository. Because it's flexible and powerful, there are lots of new commands and rules to learn, so take a look at its documentation. If, however, your needs are simple and you like a solution that utilizes existing technology to do simple and obvious tasks, Git-portal might be the tool for the job.